Fairfield, Calif. - Three juveniles were taken into custody last night on weapons charges by Fairfield Police. At approximately 9:30 p.m. on Sunday April 24, Fairfield Police officers were working a two-man patrol car when they noticed three subjects loitering near a vehicle and fence, in a parking lot of an apartment complex in the 100 block of Tabor Avenue. The detectives spotlighted the subjects and exited their patrol car to contact the group. As they approached, they heard the sound of metal hitting and sliding on the ground near the group. The group was ordered to come to the detectives’ location and detained. Thrown to the ground, and under a parked car where the group was standing, detectives found a loaded Smith & Wesson .40 caliber handgun. All three claimed to have no knowledge of the gun and were uncooperative with the detectives during their investigation. All three suspects, who were juveniles and residents of Fairfield, were booked into Solano County Juvenile Hall for weapons possession and other charges. 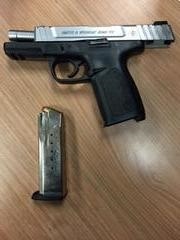 No Comment to " Three Juveniles in Custody After Allegedly Found in Possession of Loaded Handgun "